Work in comfort with this mid-sized mouse. Wired connection delivers high reliability and zero setup for instant plug and play use. Easily navigate through larger documents with the convenient forward and back buttons. Durable enough to withstand drops and spills. 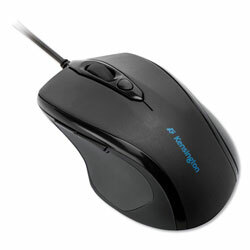 Size: 3 1/2" x 5 1/2" x 1 9/10"
3 1/2" x 5 1/2" x 1 9/10" Black Cordless Mice from Kensington! 186 In Stock today.